Well, it looks like I’ve given away the blog in the title. I think I can add 2 more Frazer lines using DNA. Not just by DNA, but DNA helped greatly. In my first 2 blogs I mentioned how I triangulated two Irish Frazer groups. These 2 triangulation groups I assumed, based on the people involved, had as their common ancestors Archibald Frazer and Mary Lilly. That couple would be the parents of the 4 brothers shown below: John, Philip, Richard and Archibald. In this blog I will disprove my previous blogs and show that those common ancestors of Frazer/Lilly were probably off by a generation. What an idiot I was in my earlier blogs. Actually, as more DNA testing information came in from my generous Frazer relatives, the smarter I look now! 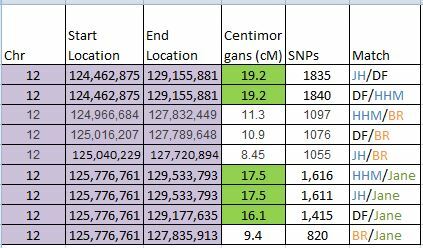 That shows that Gedmatch thinks that Jane and Michael are 4 generations to common ancestors. That’s not far. We are 1 generation from our parents, 2 to our grand parents, and 4 to our great great grandparents. I know, the chart is small. You will have to click on it to make it bigger. Jane is on the green line. 4 generations only takes her up to the white box that has Archibald c. 1802=Catherine Parker. That is 2 generations closer than the top box where I previously thought her common ancestors were. In my Blog #4, I supposed that this discrepancy was due to endogamy. Ann Turner, who knows a lot more than I, saw my blog and commented that she thought endogamy should give you more matches, not necessarily higher matches. OK, I’m willing to be wrong if I can learn by it. I did check and the endogamous Frazers did have twice the matches as the non-endogamous ones (on another line). But I needed some common ancestors for Jane, Bill, Michael, my sister Heidi and me that weren’t so far away. To tell you the end first, what I did was move Jane to the 3rd brother Richard Frazer on the second row above. Well, I didn’t move all of her, just half. What? And what does Ros have to do with it? Well Ros tested very recently. She is from Australia and her line is represented by the purple box. What I like about Ros’ DNA is that it appears that she doesn’t have 1st cousins who married each other in her Frazer ancestry. So her results are, let’s say, more specific. She matches Ros, but only through Archibald Frazer (the brother on the far right of the second row) and Catherine Parker. 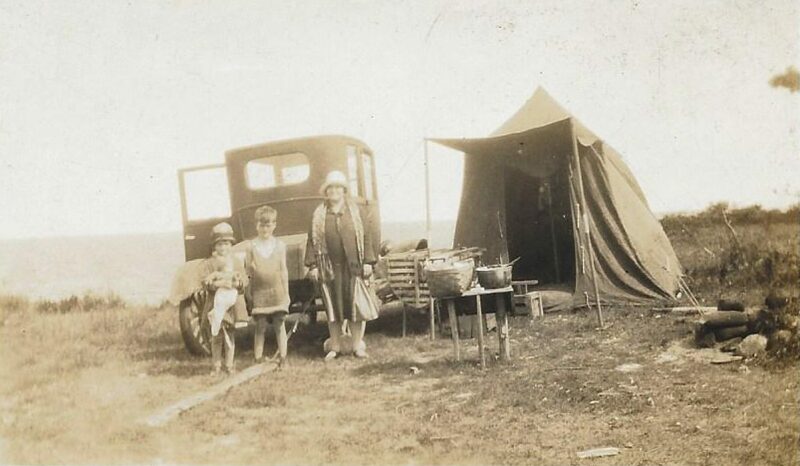 Now these 2 are the parents of Richard Paton Parker Lilly Frazer (Jane’s ancestor). However, Richard blah blah blah Frazer (Jane’s ancestor) had a wife named Jane Frazer. Her descendent (also Jane) has had a difficult time figuring out where Jane Frazer fits in. This Jane Frazer certainly isn’t a sister of her husband Richard blah blah, so she must descend from somewhere else. I put this Jane Frazer goes under Richard who is brother #3 in the chart. How and why did I decide to do that? Aunt Mabel didn’t know much about DNA if anything. Our cousin Doug from England had an Aunt Mabel (family legend says) who scoured the Irish countryside for Frazer family history in order to get her brother a coat of arms around the year 1950. We think her information before about 1700 was pretty dicey, but after that, it seems pretty good and much better than what we can figure out from Irish records (or rather the lack thereof). She was likely the one responsible for the handwritten genealogy, part of which is at the top of this blog. She mentions an Archibald who was the son of Richard (brother #3). I have no other information on this Archibald and Jane Frazer had a father named Archibald. The dates also fit in well for Jane Frazer to be Archibald’s daughter and Richard’s granddaughter. I’ve already mentioned the triangulation (above). Jane triangulates with 3 other people who are descended from Richard. 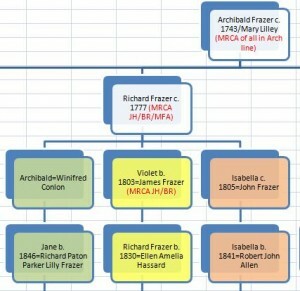 DNA-wise, it would make sense if Jane through her ancestor Jane Frazer were also in that group of Richard-descendents. With large cMs, you want the triangulation group to be as recent as possible. 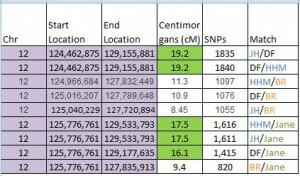 It’s still off by a generation according to Gedmatch, but I don’t think that’s too unusual. Here is the revised Richard Line with Jane’s ancestor Jane Frazer added. The second add to the line of Richard is David from Canada. Early on, before I talked Bill into testing and then the other Frazers, there was David. I noticed at FTDNA, he had a Frazer ancestor from Ireland. That was interesting. The earliest ancestor he could trace was a James Frazer who had a son in Enniskillen, Ireland. That son changed the spelling to Fraser and moved to Canada. 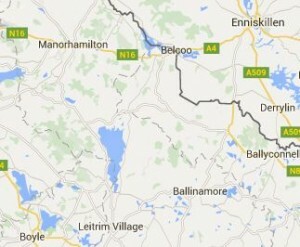 My Frazer ancestors lived to the North of the Loch (Lake) above Boyle in the bottom left of the map below. It is about 40 miles from there to Enniskillen at the top right of the map. I wish I had a photo of Aunt Mabel. She was a classy looking lady. There was a picture of her on Doug from England’s web site, but that site is down as far as I can tell. Anyway, Aunt Mabel’s chart showed a James as a son of Richard. We have no other information on this James. Can we say this James took off to Enniskillen from North Roscommon and that his son moved to Canada? I say the evidence supports that theory. Here is David (shown as DF) and how he triangulates. Well look at that. Have you ever seen a more perfect triangulation? Well perhaps you have, but it’s still pretty good. And unlike the Chromosome #1 triangulation above, it includes David. Note that everyone matches with everyone else. That’s what triangulation is, and it means these people have a common ancestor or ancestral couple. I didn’t include the matches between me (JH) and my sister Heidi (HHM) as that is too obvious. I hope that David doesn’t mind me plopping his family into mine. Brilliant Joel – good old Aunt Mabel – we have a lot to be thankful for! Milton Frazer b. 1823 VA d. bef 1880 AL was the father of my ancestress Sarah Eugenia Fraser b. 1845 NC. Do you have anything on him and his first wife Polly. They favored the Fraser spelling for a while in GA/AL/FL. (She wed George Haynes, but both died young and knowledge of their family ties was lost to us descendants). You can check to see if we are matched by Ancestry.com (I don’t know enough–but it’s so far back I’d be surprised). Hi, the names don’t sound familiar. Too bad you don’t know where they lived before coming to the US. That is one of the most difficult parts of genealogy – especially back when the records were not very good. Next PostNext Frazer DNA – Celebrity Edition!